Four schoolgirls have been arrested in Brazil after allegedly torturing a teenage love rival. The teenagers , all aged between 13 and 16, allegedly dragged their 14-year-old victim into a shallow grave they had dug before they tied her hands and feet together. The bound victim’s horror ordeal lasted for nearly four hours. The injured girl managed to escape and seek help from locals after her tormentors went to wash blood off their hands. Detectives believe the plan was to eventually kill the young girl. 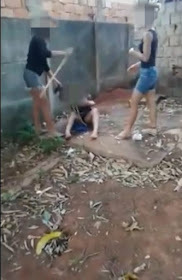 Police found the sickening footage on a mobile phone belonging to one of the four teenagers they arrested in Trindade, in the central Brazilian state of Goias. The victim was lured to the garden of the house where she was attacked after being told a party was taking place there.